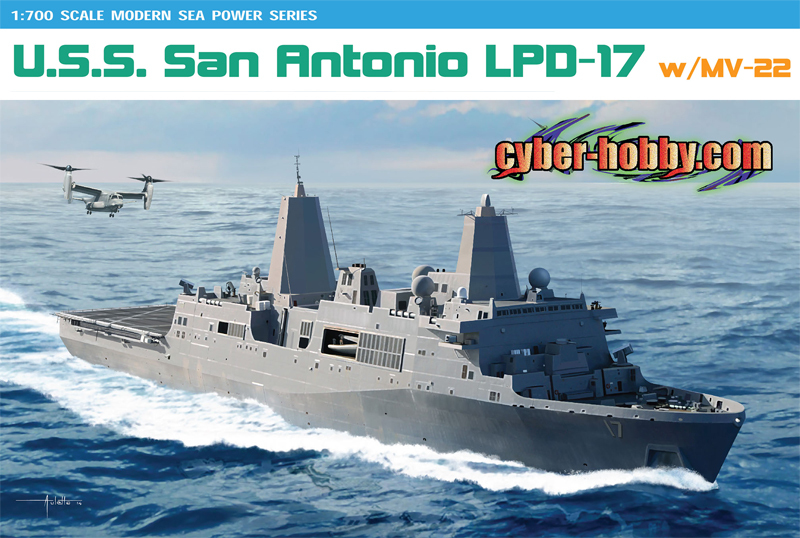 Cyber-Hobby is releasing another ship kit, this time of USS New York (LPD-21), the fifth San Antonio-class amphibious transport dock vessel to be built. 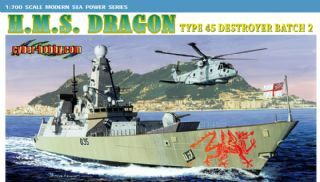 The highly detailed kit is made in 1/700 scale. 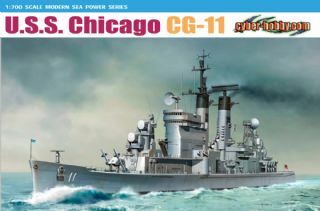 This kit’s being launched to coincide with the tenth anniversary of the 9/11 attacks, as the original ship has a close connection to that tragic day ten years ago. 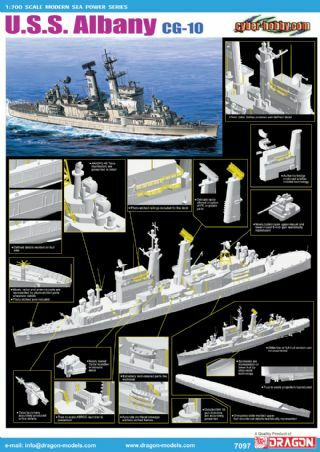 USS New York was partially constructed from 6.8 tons of steel salvaged from the rubble of the World Trade Centre in New York, and it was specifically named in memory of victims of the September 11 attack. 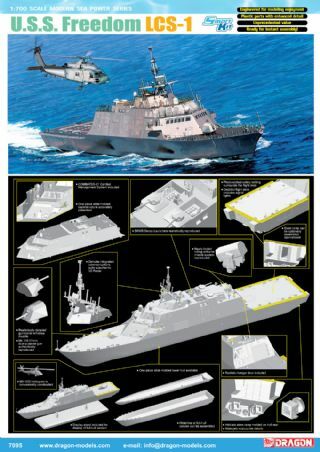 Constructed by Northrop Grumman Ship Systems, this LPD can carry up to 700 Marines as well as LCAC hovercraft and MV-22B Osprey aircraft. USS New York was commissioned into the US Navy on November 7, 2009. 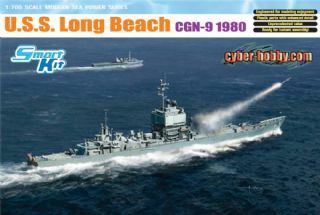 USS New York is a brand new tooling from Cyber-Hobby. 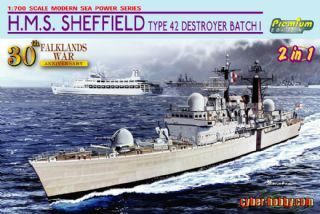 The model comes with two hulls that allow either a waterline or full-hull version to be built. 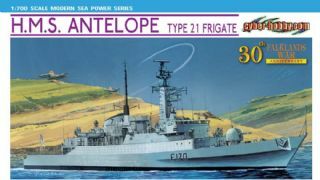 There is widespread use of slide-mold technology in the creation of this plastic ship, which results in a model that’s easy to assemble but yet one that doesn’t lack any essential detail. The hull is slide molded as a single component, and parts are cleverly separated to ensure maximum detail. 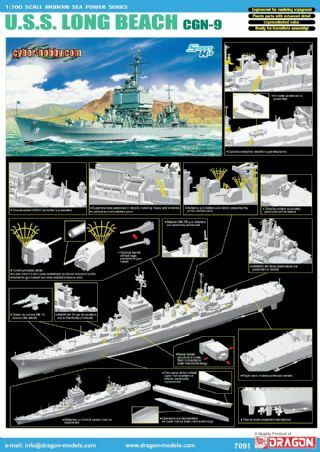 The main superstructure, for example, is a single piece. 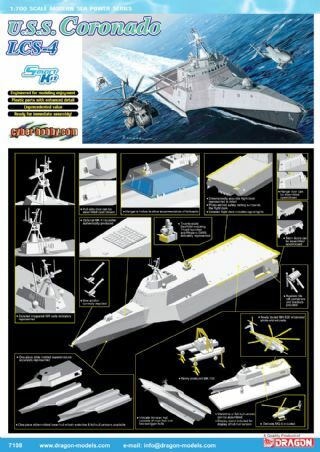 An assortment of photo-etched parts includes items like the safety net around the landing deck. 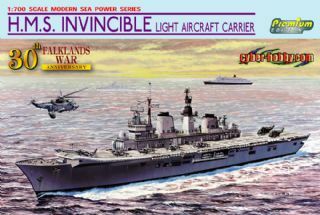 Cyber-Hobby also supplies helicopters, an LCAC hovercraft and even MV-22 Ospreys to populate the 1/700 scale replica. 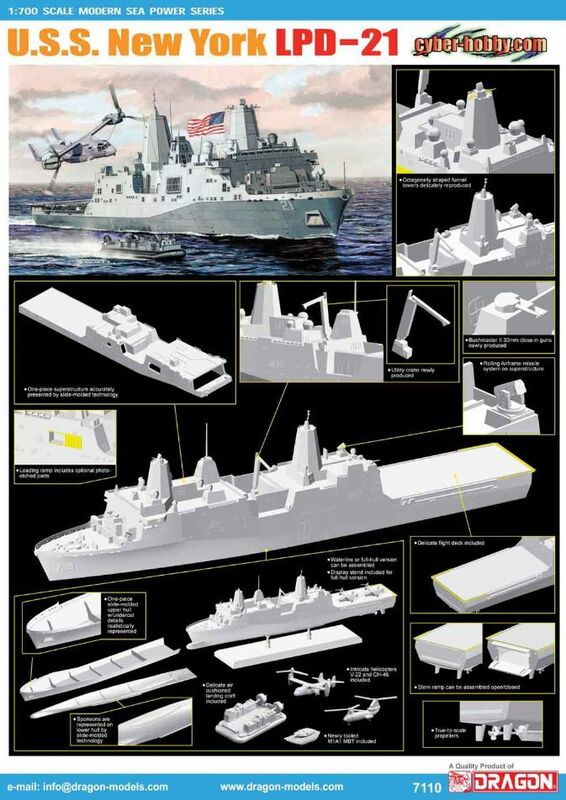 With a ship model that’s a breeze to assemble, USS New York is ready to take on terrorist or state enemies anywhere!